The four hour chicken bus ride from Xela to Guatemala city went smoothly. I got a seat and enjoyed watching the driver and helper squeeze as many passengers on as possible. I now know the reason for this. The driver is paid something like £200 a month for filling the bus up to its capacity, if they manage to get more people on they can keep the extra money. I arrived in Guatemala city in time for lunch, where I met my couch surfing host in a shopping mall. I felt like I was in North America. The mall was huge, had multiple floors, elaborate Christmas decorations and all the popular chain shops imaginable. From here we roamed around multiple other obscenely large shopping malls in the area, went in a huge Walmart and sat on a constructed grass volcano outside MacDonald’s. It was extremely surreal. On the bus ride to Guatemala City I passed numerous slums – homes built from corrugated iron, precariously standing directly next to their similarly dilapidated neighbour’s homes. Then moments later I was greeted with gross display of wealth in these commercial malls. The gap in the wealth only got more substantial when I saw a little built up suburbia area. Here buildings were white, elaborate and fancy. It felt as if I was in a different country. Only the day before children were begging on the streets, asking me for money and here I was enjoying a drink with my host in a totally rich area, where no one stopped to bother you. 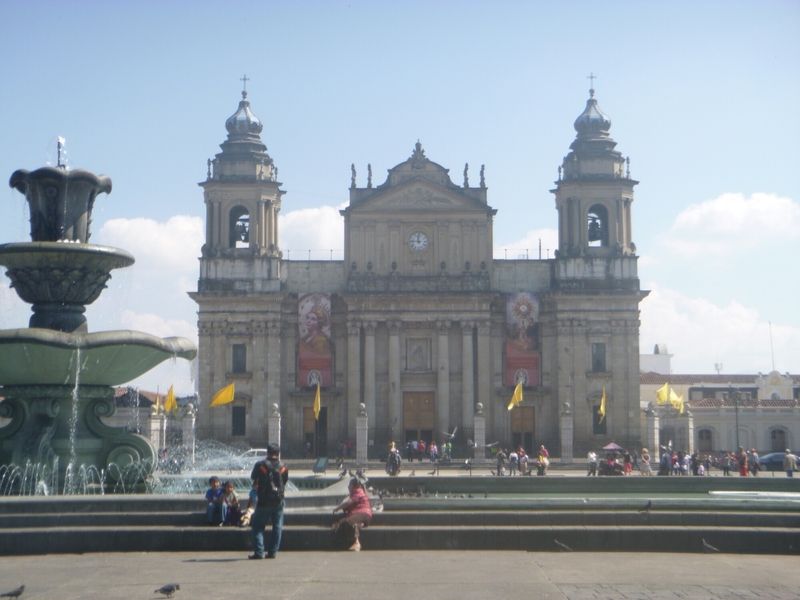 The next day, I got a tour of Guatemala city. It is a beautiful place, with magnificent government buildings, beautiful churches and tranquil parks. We went to a fun fair park and had a quick go on the slide. My host then informed me that his uncle was vice president of Guatemala – truly astounding. Next we roamed around the colourful, vibrant and fun market. 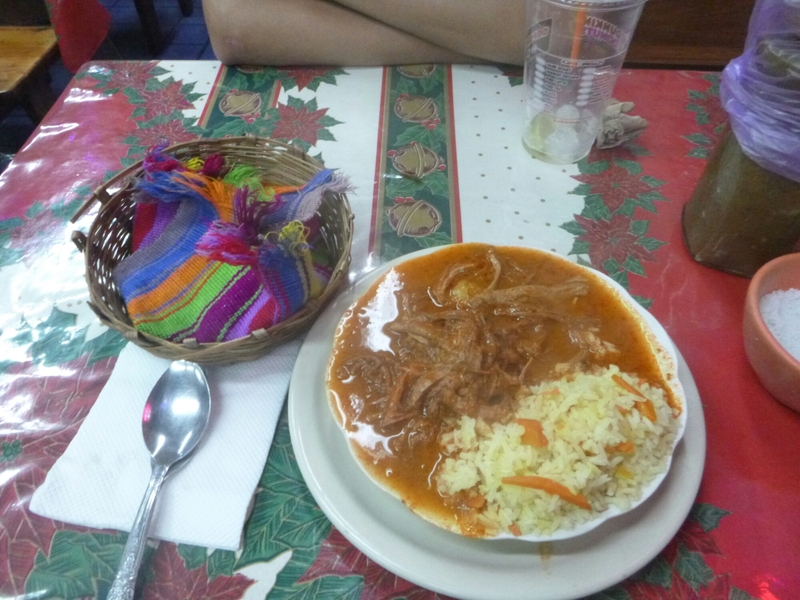 I tried some traditional Guatemalan food (a meat stew soup with rice), which was super tasty. Later that afternoon I got to look at family pictures, play with little nieces and nephews and cook my signature macaroni cheese for everybody. It seemed to go down well. I had a fantastic time with my host family in Guatemala city. They were so hospitable, lovely and caring. I felt right at home, my host was great showing me around all the best places. I got to see another side to Guatemala, which I hadn’t seen this far. Couch surfing is honestly the best, safest and most fun way to see a new place, meet new people and experience the local culture.